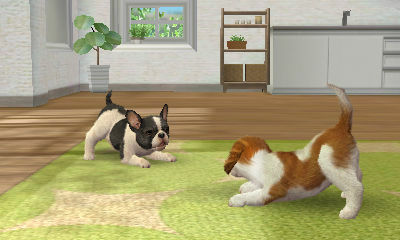 Why didn’t they call it Nintendogs + Mogs? I’ve already given my two cents on the 3DS launch line-up, but if you missed it and can’t be bothered to click here, then here’s a quick run down. 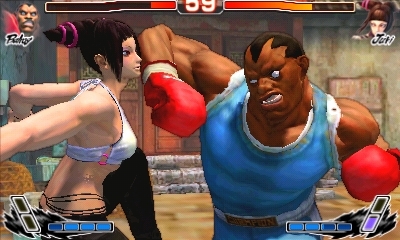 Super Street Fighter IV, Nintendogs + Cats, Ridge Racer 3D and Ghost Recon: Shadow Wars should be on the top of your list. PES 2011 3D: Pro Evolution Soccer scored 78% in the Official Nintendo magazine, but the roosters are out of date and there’s no online play so it might be an idea to wait for the next one. If it wasn’t for the fact that Pilotwings Resort and Super Monkey Ball 3D only take 3 hours each to finish, they would be on the list too. The embargo for Ubisoft’s titles doesn’t lift until tomorrow (Friday) so we won’t know until then if Rayman 3D and Splinter Cell 3D are up to scratch. LEGO Star Wars III: The Clone Wars might be worth considering, while The Sims 3, Combat of Giants: Dinosaurs, Asphalt 3D and Rabbids 3D didn’t get much love when being previewed. This leaves us with Samurai Warriors: Chronicle – which scored 5/10 on Eurogamer – and Madden NFL Football which isn’t of great interest to 97% of us Brits. It’s probably OK though. There are a few other big name titles out this week too. Crysis 2 is apparently gorgeous but the main character is a bore and the plot is dull. Do people really play FPS games for the plot though? There was mild concern that the PlayStation 3 version was lacking behind the Xbox 360 version (EA pulled the demo after people started complaining about screen-tearing and other faults) but word has it that the final version is fine and dandy. Scores so far include an 8 from Eurogamer and a 7 from 360 Gamer Magazine. One of 360 Gamer’s writer also said on Twitter that LEGO Star Wars III: The Clone Wars is surprisingly brilliant. That’s out on every format, including PSP and PC. Dissidia 012: Final Fantasy and Naruto Shippuden: Kizuna Drive also arrive on PSP this week. There’s a special “Legacy Edition” of the former which Amazon is selling for no extra cost to the standard. There hasn’t been much hype behind PlayStation Move Heroes, which stars Ratchet, Clank, Jak, Daxter and Sly Racoon. Metacritic’s average is currently 57% which perhaps tells us why. Tomb Raider Trilogy – which is another PlayStation 3-exclusive – looks like being a better purchase. Next week: WWE All Stars, Shift 2 Unleashed, Ar Tonelico Qoga, Tiger Woods PGA Tour 12, The 3rd Birthday, Dynasty Warriors 7 and movie tie-in Rio. The 3DS launch line-up is a funny thing. There’s a lack of an easily indefinable system seller, while the likes of THQ, Take-Two and Activision don’t have a single title ready. On more positive note, however, it’s quite astonishing that Ubisoft has managed to get six games due for launch. Activision would have presumably given us DJ Hero if they hadn’t lost all faith in the franchise. It’s a little disappointing that it was axed – without the need for a peripheral and no music-based 3DS games on the cards it could have found a new audience. EA also canned MyGarden, but that’s less of a loss – it didn’t appear to resemble a proper game, more of a tech demo or a relaxation tool at the very most. A game for pansies, even. If you haven’t made your mind up on what to get with your 3DS yet, then maybe our guide can guide you in the right direction. That’s why it’s called a guide, see? A last minute inclusion into the line-up, reviews have been sadly disappointing claiming that the whole thing can be done and dusted in three hours. NGamer were particularly miffed that the island on which it’s set had already been used in previous games – such as Wii Sports Resort – thus leaving little new to explore. With decent visuals it would appear to be a good way to show off your new handheld, but don’t coming crying to us when you’ve seen it all in an afternoon. It may not be the definitive version but it’s still one to think about taking home on launch day. Nice features are plentiful, including a demo that can be beamed to nearby 3DS owners. StreetPass analyses your save games and fighting styles and will automatically play battles for you with any 3DS owning strangers that you come across on your travels too. A good conversion of a good game it would seem. The fact that this is the first game shipped to the press to review (Eurogamer published theirs on 1st March) shows that Namco are pleased with what they’ve achieved. 3DS features are heavily used – you can take a photo with the camera for your driving license – while the tracks are a mixture of old and new. Worth considering, even though there’s no online play. Available in different flavours, a la the first Nintendogs range, NGamer awarded this glorified Tamagotchi 80%. Features are bountiful, including breeding and gift sharing via StreetPass and use of the 3D camera, pedometer and AR cards. The fur effects have been greatly improved (because that’s important, right?) as has the voice recognition system. The cats can’t be entered in contests, walked or be taught tricks, which may be disappointing for moggie lovers, but it’s likely that this is one of the few launch games you’ll come back to time and time again. 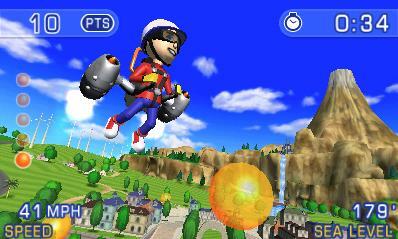 Sega’s simian sim has the same problem as Pilotwings Resort – it’s good but too short. The core game has 80 levels compared to the original’s 310 and there are just 2 mini-games. The GameCube original had 12; Step and Roll had 21. As such, it’s probably worth waiting for the price to drop. One of two Tom Clancy ’em ups, this isn’t a new game as the title suggests but rather a retelling of Chaos Theory. 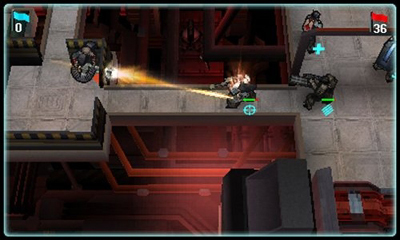 Features are thin on the ground, such as the lack of co-op and multiplayer, but there are new gadgets that make use of the 3D screen such as a hacking mini-game. There’s a whiff of a rush job about it, so wait for the reviews first. It would appear that EA’s biggest brag is that you can send your Sim to other 3DSs via StreetPass. Unimpressed? So were NGamer, who claim that the graphics are “minging” and that it suffers from slowdown even during the character creation screens. Also in their preview they mention the ability to cause an earthquake by shaking the handheld. Will this make it into the retail version? If it has already gone ‘gold’ then it might be too late to remove it. It’s good to see a platformer in the line-up, but Rayman 2 again? It was a good game back in the day but most gamers worth their salt will have played it before. In fact, Ubisoft released a conversion of this very early in the DS’s life. And it’s available on iOS for literally pence. It would have been a real treat to have seen Rayman 3 instead; that too was a genuinely great game but Ubisoft always acts as if they’re ashamed of it. If you’re desperate for some colourful platforming it’ll probably fit the bill but you’ll only be sending the message to publishers that it’s all right to endlessly recycle old code. …like this one, which gained the lowest scores in Famitsu when they reviewed the launch titles. It’s a very basic affair with a ‘paper, sissors, stone’ style combat system. The DS versions were dire; this is no different. NEXT! See: we told you there were two Tom Clancy titles. Memory fails to recall another console that was lucky enough to launch with a tactical turn-based strategy game and although the visuals may be simplistic compared to other titles it’s the only game present that’ll get your grey matter ticking. Playing a lot like Advance Wars, it has quite some heritage behind it having been created by X-COM chap Julian Gallop. Give it a go: you may be surprised. The Official Nintendo Magazine gave Konami’s soccer sim 78%, championing the smooth difficulty curve and its compulsiveness. But with no online play and rosters that are six months old it may be a better idea to wait until the next football game arrives on the scene. “Bwaaah!” indeed. Previews were far from positive and both NGamer and Official Nintendo Magazine were missing reviews of this side-scrolling platformer in their launch specials. This should tell you everything you need to know. 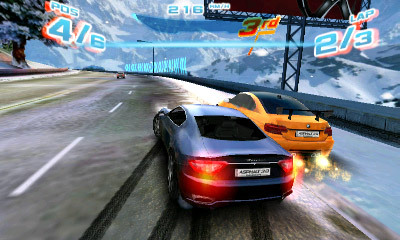 Let’s face it – this was always going to be in Ridge Racer’s shadow. There are just 9 tracks compared to Ridge Racer’s 15 and reviewers have moaned about slowdown. The Official Nintendo Magazine were impressed with the visuals, pointing out that you can see the dashboards through the windows, but then went onto say it’s not worth the asking price. We’ve left this to last as you know what you’re going to get here. It might be an idea to wait for LEGO Pirates of The Caribbean instead, which despite being a few months off (ETA: May 2011) already has StreetPass battles confirmed. It’s your call – it’s very unlikely to be any less than average. Coming soon: Madden NFL Football, Dead or Alive: Dimensions (delayed in Japan, was due 24th March), Pac-Man & Galaga Dimensions, Puzzle Bobble Universe, Thor: The Videogame, James Noir’s Hollywood Crimes 3D, Driver: Renegade 3D, The Legend Of Zelda: Ocarina Of Time 3D, Professor Layton And The Mask Of Miracle, Steel Diver, Paper Mario 3D, Starfox 3D and Combat of The Giants: Mutant Woodlice (maybe). Nintendo’s E3 conference started off with a video of Zelda, now titled fully Zelda: Skyward Sword. Here, the Motion Plus is used to give Link free movement of his sword – at one point during the video Link waved it in circles to make a door with eyes go dizzy. The graphics have a very traditional Zelda vibe, best described as a cross between Twilight Princess and Wind Waker. “I think this game will be remembered as a key turning point in Zelda’s history,” said Miyamoto after showing footage, which you can view for yourself here. Mario Sports Mix 2011 was the next game shown; the video showed volleyball, ice hockey and basket ball. Next up was NBA Jam, followed by Just Dance 2 (yawn), the already unveiled Wii Party and Golden Sun: Dark Dawn for DS…which was shown at last year’s E3. The confirmation of a Wii-exclusive remake of Goldeneye 007 was actually leaked yesterday, but it still prompted cheers from journalists lucky to be at E3. Online multi-player is promised. And so is Daniel Craig’s face. Fans of puns should get a kick out of Kirby’s Epic Yarn, as it’s set in a world made out of wool. It’s a 2D side-scroller for Wii. 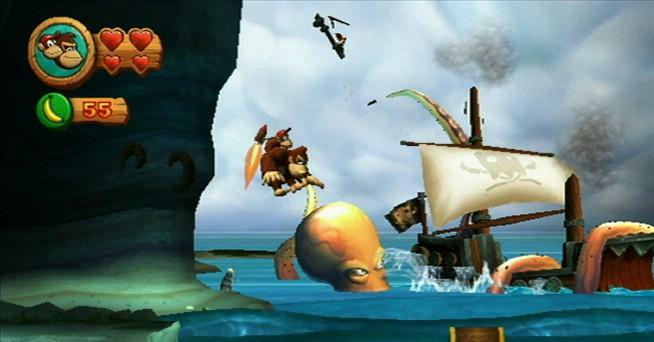 The freshly announced Donkey Kong Country Returns – from Metroid Prime developers Retro Studios – is also a 2D-affair. It’s out this winter. Expect a distinct retro feel to it – even the music is similar to the 16-bit original. 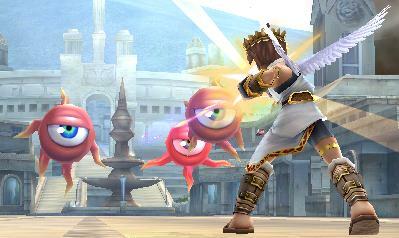 PilotWings and Kid Icarus games have been long rumoured. Today they were finally confirmed but not for the Wii, but rather the Nintendo 3DS. Thankfully, you don’t have to wear glasses to get the 3D effect. The bottom screen remains as a touch screen while 3D top screen is a decent size (3.5-inch) and as promised the 3D can be adjusted via a slider. Nintendo said they didn’t want to make the 3D screen a touch screen as they “realised that fingerprints and other smudges reduce the 3D image”. It has an analogue stick, which is a good thing, and a 3D camera with two lenses while wireless functionality will automatically download new rankings, ghosts and the like. 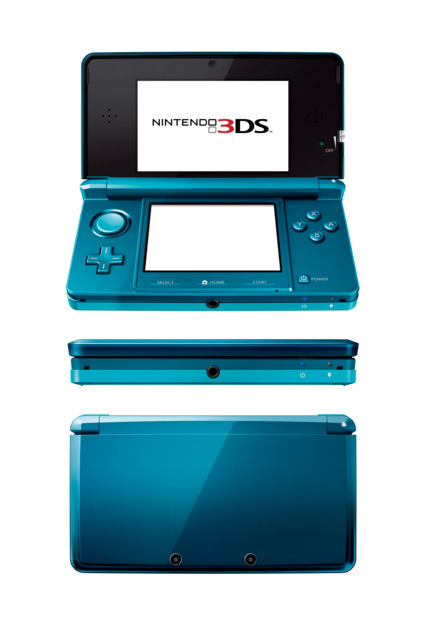 No release date or price were revealed for the snazzy new handheld but two different colours were shown – red and turquoise. The list of software for the new handheld is impressively vast. Nintendo themselves announced Animal Crossing, Kid Icarus Uprising, Mario Kart, Nintendogs + Cats, Paper Mario, PilotWings Resort, Star Fox 64 3D and submarine sim Steel Driver. Third-party efforts meanwhile include (breathe in) DJ Hero 3D, Shin Megami Tensei, Resident Evil Revelations, Super Street Fighter IV, FIFA, The Sims 3, Asphalt GT, Bomberman,, Metal Gear Solid: Snake Eater 3D, Contra, BloodRayne: The Shroud, A Boy and His Blob, Ridge Racer, Super Monkey Ball, Dead or Alive, Ninja Gaiden, de Blob, Saints Row: Drive-By, Assassin’s Creed: Lost Legacy, Driver Renegade, Ghost Recon and Splinter Cell: Chaos Theory (breathe out). I’m somewhat surprised to see many “mature” titles among that list. At the same time though, I’m a little dismayed by the lack of new IP – the majority of games announced were either license or franchises. Still, I bet Sony wishes they had some of those big name brands on PSP.